Same Performance as Carbide Overlay at 1/2 the price! ENDURA Dual is an advanced abrasion-resistant steel additionally alloyed with “High Titanium Carbines” (0.6%). 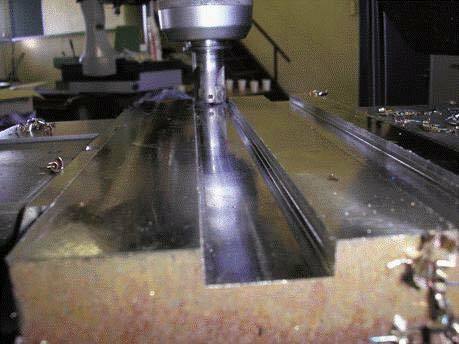 This innovative grade is mainly dedicated to “Sever Sliding” abrasion where conventional water quenched steels (500HB, 550HB), hardfacing plates or hard-cast parts are traditionally used. Compared to ENDURA, ENDURA Dual capitalizes upon an innovative metallurgical concept, and a unique chemical formulation. 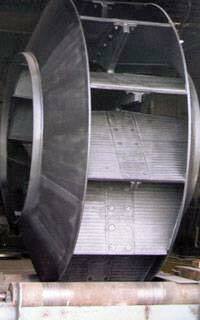 It is produced by Oil Quenching, which reduces the level of the residual stresses that is encountered within the plate after heat treatment, compared to more drastic water quenching. 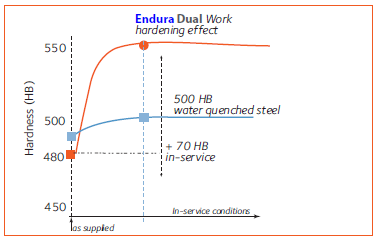 Similar to ENDURA, ENDURA Dual also has unique “Work Hardening” properties. With impact, ENDURA will “work harden” from 480 BHN to 560 BHN. 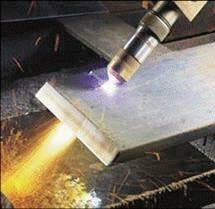 a superficial hardening following a very efficient work hardening capability in service, governed by a metallurgic phenomenon called TRIP effect (Transformation Induced by Plasticity). 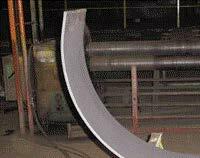 Fig 2: Bending (successive folds)No other competitor offers wear resistant steel at this level of hardness 500HB, with such high abrasion resistance combined with high resistance to cracking in service! 10% > 18 ft. lbs. Wear resistance depends not only on the hardness of the steel at delivered state, but also on other properties, such as crack resistance, work hardening effect, strength, ductility, softening resistance, etc. As its initial structure not fully martensite (a mix of martensite, bainite and retained austenite), ENDURA Dual has the ability to work-harden when submitted to local plastic deformation in service. Plastic deformation induces a surface hardening phenomenon by transformation of retained austenite into fresh and very hard martensite while the material remains ductile underneath, making it most effective to withstand both abrasion and heavy impact in service. 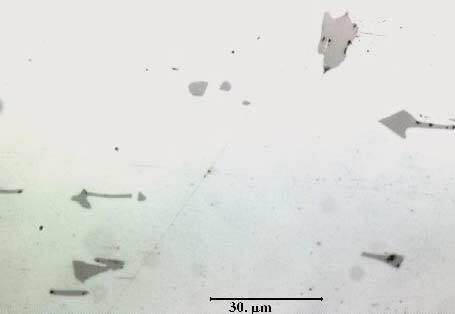 In addition, the super ductility of the retained austenite contributes to improve the lifetime in service by allowing larger micro shearing and thus delays the ultimate tearing of metal particles from the surface of the material exposed to the abrasive. 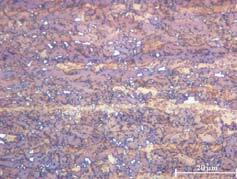 On this typical microstructure of ENDURA grades, the retained austenite grains revealed by means of Klemm reactive etching appear in white. 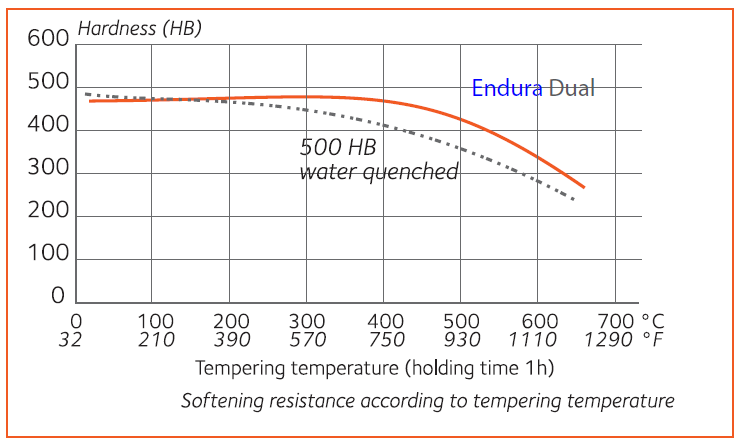 When subjected to plastic deformation in service (impact or high pressure), ENDURA®Dual takes advantage of a surface hardening about 70 HB, whatever the applied strain level. 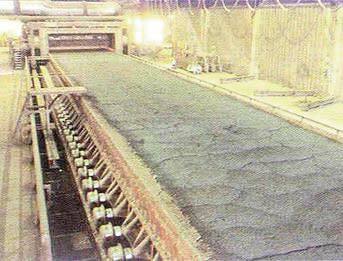 The extreme abrasion resistance versus the conventional wear resistant steels (500HB, 550HB…) is gained by the presence of the primary titanium carbides which are precipitated during the first stage of the solidification (already present within the semi-products, slab or ingot, before rolling and heat treatment). 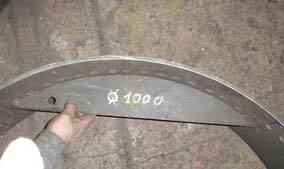 These titanium carbides exhibit an average hardness of 3000HV (Vickers hardness) and therefore create numerous hard spots in the steel matrix like crushed gravel in concrete. Chemical composition of ENDURA Dual, and specially chromium, molybdenum and huge titanium contents, give a high softening resistance to the material. This property allows using ENDURA Dual in hot service conditions, at a maximum of 450°C (840°F) while conventional 500 HB water quenched steels are limited to 250°C (480°F). 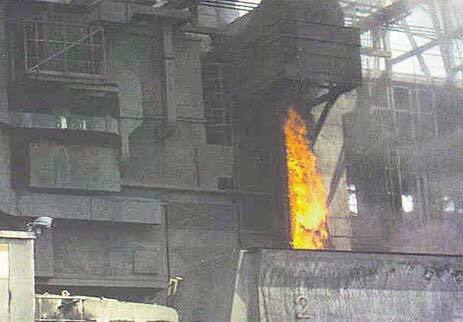 Whatever service conditions are, the original metallurgical concept of Endura Dual gives the material an improve of its performance in terms of wear resistance and process ability, compared to other conventional 500 HB water quenched steels, especially for extreme applications, where severe abrasion conditions are combined with huge impact, heat or moderate corrosion. All classical thermal processes (gas-plasma-laser) can be used. Plasma/laser processes are specially recommended. They provide increased precision and cutting aspect and induce a thinner Heat Affected Zone (HAZ). Electrodes and flux shall be dried according to supplier’s recommendations. 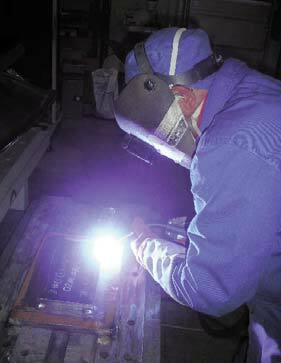 For welds without preheating, an austenitic welding wire shall be used. Please note: This technical data and information represents our best knowledge at the time of printing. 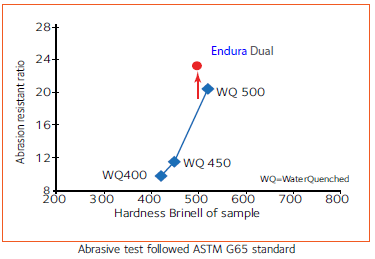 However, it may be subject to some slight variations due to our ongoing research programme on abrasion resistant grades. We therefore suggest that information be verified at time of inquiry or order. 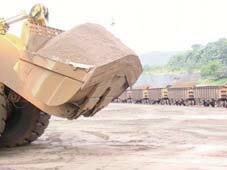 Furthermore, in service, real conditions are specific for each application. The data presented here is only for the purpose of description, and may only be considered as guarantees when our company has given written formal approval. 2. ENDURA DUAL has been developed specifically for its abrasion resistance. Customer’s usage of ENDURA DUAL for any other purposes, not directly resulting from its abrasion resistance, is his own prerogative but won’t, in any way, engage TITUS STEEL’s responsibility. In addition to the recommendations given in this document, customer will have to follow the industry standard quality rules for any processing operation performed on this material. Click here for the ENDURA Dual brochure. Click here for more information about liners and grizzlies. Click here for a presentation on the application of ENDURA Dual in Libeheer 994.